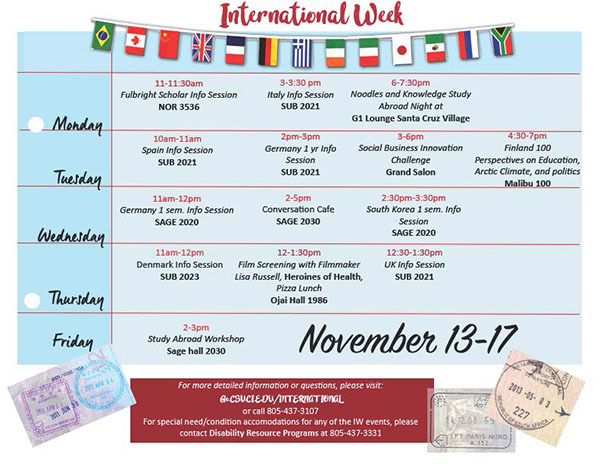 Nov. 7, 2017 – CSUCI’s annual International Education Week will kick off on Monday, Nov. 13 at noon and continue throughout the week. This week will be a collection of curricular and co-curricular activities focused on exploring CSUCI’s mission pillar of international perspectives. It is present and co-sponsored by the Office of International Programs & the Center for International Affairs.There will be exciting events throughout the week, including study abroad information sessions, international speakers, movies, food, dance and more.To view the full schedule of events click here (PDF, 206KB), or visit the International Education Week website.For more information contact Jasmine Cardenas at 805-437-3107 or international@csuci.edu. OPINION: 2070 will be here faster than we think; how do you want it to look?